Loft insulation thickness increase over the years. -The amount of insulation required by each building has significantly increased over the past 50 years. -Current building regulations require a minimum depth of approximately 125 mm of a high grade insulation such as wood cellulose or mineral fibre (or some kind of equivalent to that if you are getting some of the insulation from insulating block work). -The thicker the insulation the more energy efficient the building is likely to be. -It is easier and more cost effective to build in wall insulation at the beginning of construction, compared adding more later. -Figure 1 shows which building spaces should be insulated. 2. And insulation thickness. (It is important if you plan to install it in a confined space, such as in wall cavities and cathedral ceilings). So, how much insulation to install? -The efficiency of any insulation material is measured by its R–Value or Thermal Resistance. · Other savings to be made from high insulation such as better use of space (on the basis that cold damp areas get underused) and less risk of damage through condensation. Global warming - Whatever your views about the dangers of global warming, house building, unlike, say car manufacturing, is a very long term undertaking and therefore it makes sense to think in terms of hundreds of years rather than a decade or two. All extra insulation will contribute to lower fuel use in the future. This would be an argument for very heavy insulation. Fuel prices- Although fuel prices may increase substantially over the next few decades there may be a more distant future with cheaper clean fuel from new technologies such as nuclear fusion. But don’t hold your breath. Still an argument for heavy insulation! Relative cheapness - Compared with the overall price of building materials and the price of energy, insulation is a minor cost so this is an argument for heavy insulation. The view taken with the Passivhaus standard is that a thickness of over about 300mm of a high grade insulation in walls starts giving diminishing returns. 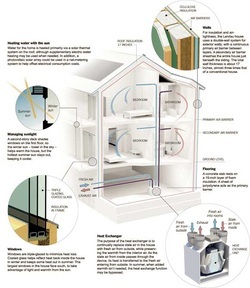 Rather than more insulation it is important to look at the form of the building and air tightness. Window problems - Very thick wall and roof insulation can considerably cut down on the amount of light which gets in through windows (and the view angle available). Overcoming this problem may involve having splays or reveals to the walls round the windows. 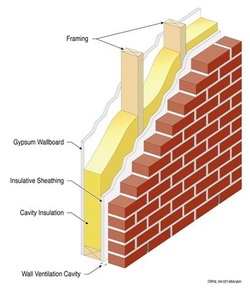 -Both insulative sheathing and cavity insulation are specified for walls because it is important to use them together as a system. -The band joists, or outside edges of the floor frames, should be insulated while the house is under construction. · Very good levels of insulation with minimal thermal bridges ( 300 mm insulation thickness). By specifying these features the design heat load is limited to the load that can be transported by the minimum required ventilation air. Thus, a PassivHaus does not need a traditional heating system or active cooling to be comfortable to live in - the small heating demand can be typically met using a compact services unit which intergrates heating, hot water and ventilation in one unit (although there are a variety of alternative solutions). It is also essential to follow a quality control procedure to avoid onsite problems which may prevent excellent levels of airtightness and thermal insulation being achieved. Please note that the following information is for guidance only, compliance with the PassivHaus standard must be assessed using the PassivHaus Planning Package. The PassivHaus Institute also has an informative checklist which outlines the typical process undertaken to achieve PassivHaus. Passive use of solar energy is a significant factor in PassivHaus design. Some consideration is given with regard to north/south orientation, but the improved energy savings resulting from passive site design are often overlooked. Windows should have U-values not exceeding 0.80 W/m².K for both glazing and frames - this requires the window frame to incorporate insulation and the glazing to be triple. Solar Heat Gain Co-efficient through the glazing should be at least 50%1. Air leakage (n50) through unwanted gaps and cracks in the building fabric must be less than 0.6 times the house volume per hour under negative and positive pressurisation. Design air permeability of 7 to 10 m2/hr/m3@ 50 Pa. This is approximately a factor of 10 poorer than the PassivHaus standard. Research has also shown that air permeability values for completed dwellings frequently exceed these design limits. Fresh air may be brought into the house through underground ducts that exchange heat with the soil. This preheats fresh air to a temperature above 5°C (41°F), even on cold winter days. The majority of new-builds do not achieve good enough air permeability values to warrant the incorporation of a whole house ventilation system - thus trickle vents, extract fans, or passive stack ventilation is commonly used. Most of the perceptible heat in the exhaust air is transferred to the incoming fresh air (heat recovery rate over 80%). Low energy refrigerators, stoves, freezers, lamps, washers, dryers, etc. are indispensable in a PassivHaus. Dedicated low-energy lights are provided in a number of rooms in a new dwelling - if appliances are supplied they will be generally C-rated or perhaps 'Energy Saving Recommended' in some instances (as these are widely available). The Solar Heat Gain Co-efficient (SHGC) is provided as a guide, it can be adjusted for glazing on different facades. This can help either reduce heat loss on sheltered sides/ north facing glazing, or alternatively help to reduce the likelihood of overheating when specified in conjunction with other features/strategies (please note that the SHGC of a window usually decreases as the U-value improves). There is a useful study on upgrading houses to PassivHaus standard in Ireland produced by Sustainable Energy Ireland.